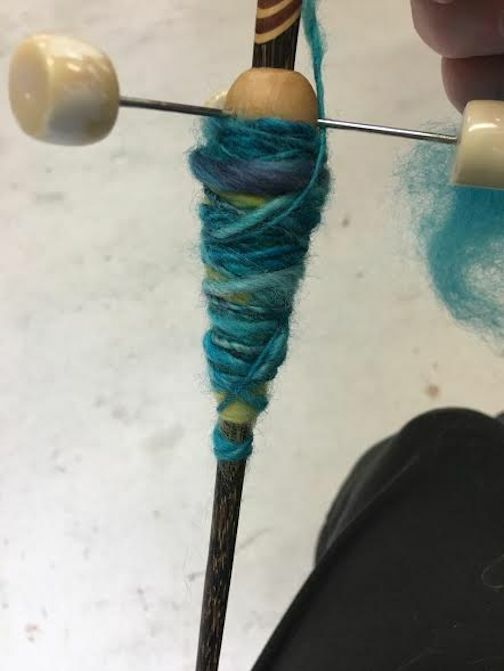 I tried my hand a spinning yesterday. It looks like I tried my feet instead of my hands because my thread was so uneven. Our lovely teacher Melody said that my clumpy yarn is called Artisan Yarn and it’s okay to be uneven. She’s very gracious. I love it whether it’s Artisanal or Awful. It’s my first attempt. You always have a fondness and forgiveness for your first of a new skill. And, you have to hang on to it so you can see how far you progress over time. I’m thinking it can only get better from here, although honestly even if I never get better, I loved it. I enjoy learning new things. My mom and my SIL Diane were also learning how to spin. We had three different types of drop spindles. Mine was a trindle drop spindle, Diane’s was a supported spindle, and my mom’s was called a spindolyn. In 3 hours we each spun about enough yarn to make a bandaid. Hats off to the true pioneer women of yesteryear. I will continue to practice my spinning. 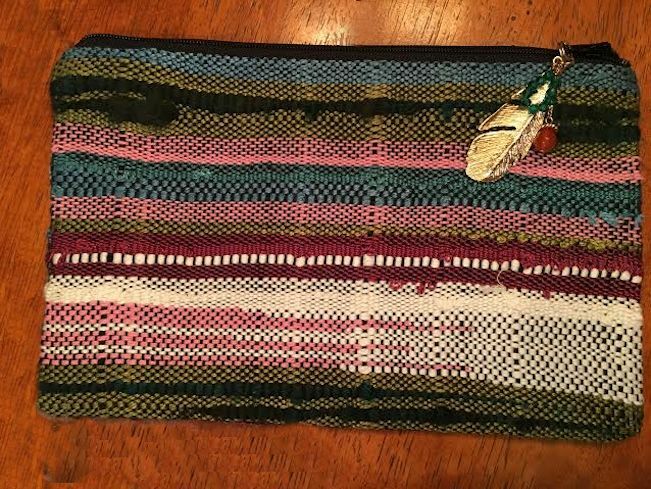 I enjoy the weaving I’ve been doing and I think it will be even better when I can incorporate some homespun yarn into it. 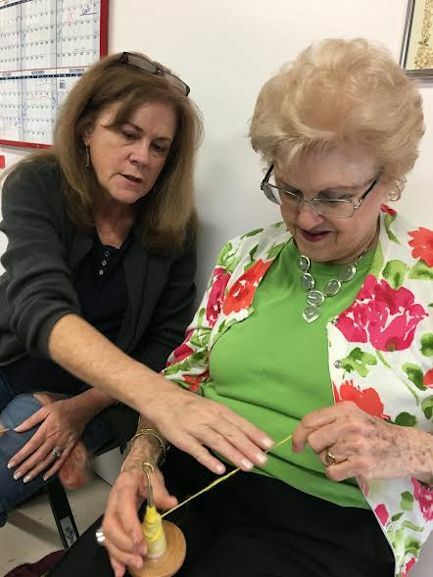 After class we came back to the house and I showed Diane how to make a zippered pouch. She made this one to match her sporty blue purse. Finally, after all that concentration, footwork (LOL) and brainwork, we sat down to a Pear Salad. It was really easy to make and very refreshing. Do you like my Gracious Living cheese roses? I came up with that little garnish idea. I let the slices of Havarti cheese warm a little on the counter in the deli package, rolled one up, and sliced it into thirds. I turned out the edges a little to look like flowers. Enchanting, I know. Perhaps I will make some more for Valentine’s Day tomorrow. A dozen cheese roses! Toss apples and pears with lemon juice, drain. 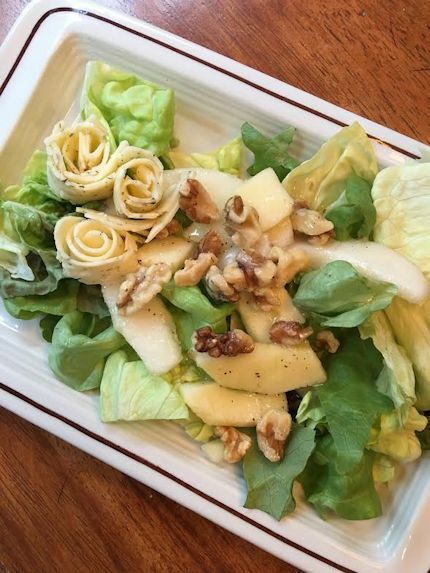 Arrange lettuce on 6 salad plates; top with apples, pears and cheese. Combine remaining ingredients except walnuts in a blender and blend till smooth and sugar is dissolved. (You can also just shake in a jar if you don’t have a blender.) 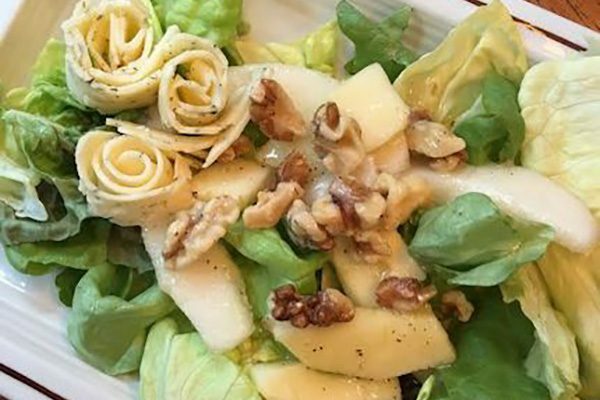 Drizzle salad with dressing; sprinkle with walnuts. Serves 6. Back to practicing my spinning. When I see Rumpelstiltskin’s face in my window, I’ll know things aren’t going well, but for now, I’m doing just fine.